The UGA Office of Online Learning has an Instructional Design team that provides advice to faculty members in conducting and designing their online courses. 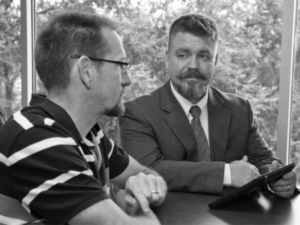 The following guest blog is written by instructional designer Flint Buchanan and video producer Stephen Bridges, who both assist online faculty members. Guidelines for using media is one of the more frequent requests our media team gets from faculty, so it seems natural for this first post to cover some of these. You want to avoid paralysis-by-analysis so a plan needn’t be overly elaborate. Keep your plan focused on the big picture. For example: What is the thesis of this media? There needn’t be a formal script (although this would be very helpful in making your content accessible), but it would be very helpful if there was an outline if just to keep on topic. Generally speaking, as the length of the media increases so does the viewer drop-off rate. Additionally, around nine minutes is where the most significant drop-off occurs. A hurdle sometimes encountered when making media for education is how to include EVERYTHING and it’s only natural. In order to cover the subject at hand means touching on the relevant supporting evidence; any contradicting evidence and if/how it was refuted; the cultural and historical perspectives; outstanding critiques and critics, etc… All of these are vital areas of interest but deciding to include them all risks creating something of either epic proportion, density, or both. The solution is to create multiple smaller pieces rather than one singular piece that is overly complex and unwieldy. One of the easiest ways to achieve the above is to actually watch your media before making it available to students. In doing so, try to take the perspective of the student and see if the media accurately communicates what you intended in the way you intended. If you have any questions regarding the technical “how to” of editing content, the Office of Online Learning offers resources to help you with this process. Of course these should all be considered rough guidelines and we plan to expand each of these topics in the future.